Kuedo and Joe Shakespeare's hugely promising Knives label debut the hyper-lucid constructs of J.G. 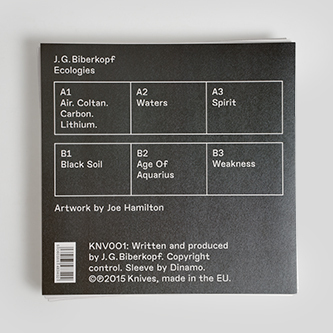 Biberkopf with 'Ecologies', housed in suitably striking artwork by Joe Hamilton. Hailing from Lithuania, Jacques Gaspard Biberkopf has hatched a dramatic and immersive aesthetic, drawing upon cutting edge instrumental grime, net phenomenology and cyber-ambient sound design to patch collaged spheres working across club, theatre and digital radio contexts. 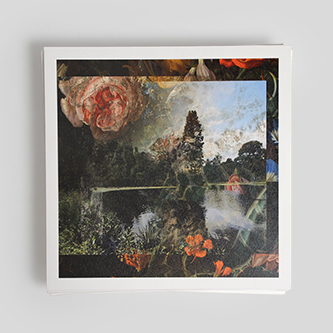 As with the output of contemporary artists like T C F or Elysia Crampton, thru to his networked peers such as v1984 and Sentinl, J.G.B's music describes imagined topographies, scenarios and environments in hyperreal detail - emulating and accelerating the natural world in complex, crystalline bursts of code; a field trip into the representations of nature that emerge from the digital-social media scape. 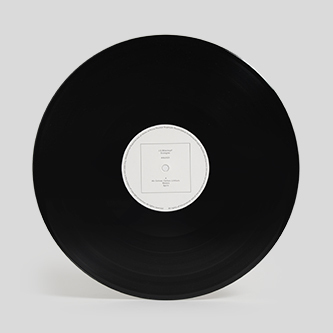 In six succinct pieces, he traverses a sci-fi soundtrack's worth of ideas and atmospheres between the perilous entrance of 'Air. Coltan. Carbon. Lithium', and the deliquescent, hyaline geometries of closing peak 'Weakness' with its poignant mantra, "every day, every night". Between those coordinates, he renders a world of sheer 3D gradients and dynamics, scaling the weightless, Ballardian grime chicanery of 'Spirit' and impeccably timed lacuna of 'Waters', before the narrative plunges vertically into the corrupted sim-stim proprioception of 'Black Soil' and follows the gyroscopic slowfast tekno rollcage vectors of 'Age of Aquarius'. 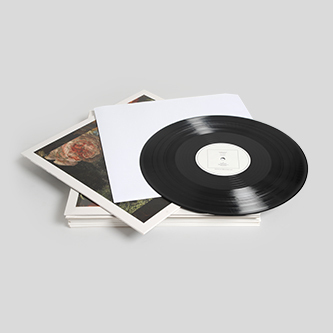 Accompanied by the hyper-natural sleeve art of Australia's Joe Hamilton, 'Ecologies' is a very necessary look for anyone in pursuit of vivid, synthetic, and cinematic sensation from modern music.